They hate it so much that they will only drink it if they are extremely thirsty. And yes, your cat thinks that bowl of water in the kitchen floor is full of stagnant water that is full of disease. What your cat really wants is fresh, moving water. That is why it tries to drink out of the bathtub faucet. Why Do Cats Not Like Water in a Bowl? Water in a bowl has a different smell and taste to the cat. Water that is motionless in its container will have less oxygen than water that is moving. The churning motion of moving water allows more oxygen to dissolve in the water. I believe that cats can taste and smell a difference between oxygenated and oxygen-depleted water. They prefer water that has more oxygen in it. 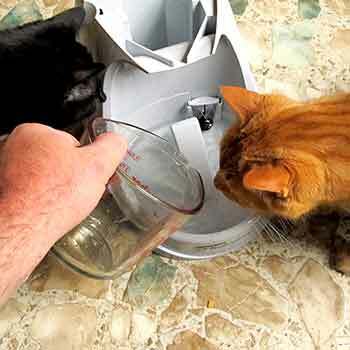 Cats instinctively know that running water is safer to drink than stagnant water. Stagnant water creates a more hospitable environment for bacteria and parasites. In nature, stagnant water is more likely to be contaminated with animal waste, disease carrying insects, etc. Cats just know that running water is safer for them. Most cats will go thirsty instead of drinking out of a water bowl. As a result, the animal will be in a chronic state of dehydration. This chronic dehydration can lead to urinary tract and kidney disease and generally shortens the animal’s lifespan. If you feed with dry food only, the problem is even worse. 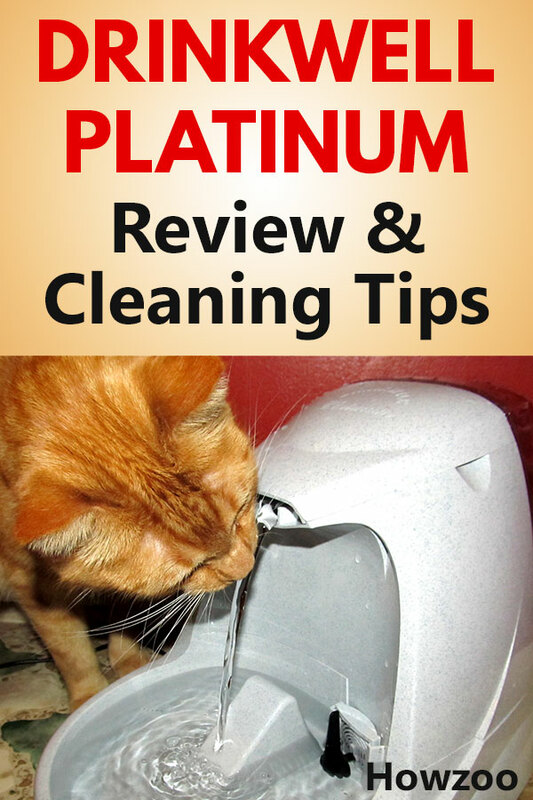 We have 3 cats and the water bowl needed constant cleaning and water changes. I am a busy person and I like to eliminate as many chores as I can. The water bowl thing had turned into a daily chore for me. If I didn’t change out the water daily, they would refuse to drink. We were feeding our cats dry food. I found out that cats on dry food generally don’t live as long as cats that eat moist food. Basically, chronic dehydration is made worse with an all dry-food diet. 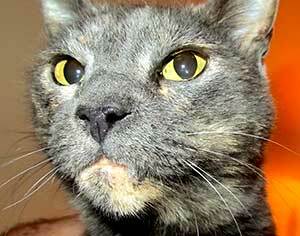 We still feed our cats a premium, grain-free, salmon kibble and we supplement that with cans of moist food. We tried to switch over to an all canned-food diet but it didn’t work out. They don’t mind eating some canned food but they refuse to switch over to a 100% canned-food diet. We were also throwing away a lot of the canned food, since they wouldn’t eat it when it got a little dried out in the bowl. We got the fountain set up and the cats were fascinated by it but also a little leery of it. Once they got brave enough to take a drink, they were hooked. They would stand there and drink for a long time, longer than I had ever seen them drink. Dora, our rescued feral cat, actually started lying in the floor beside the fountain. She would stay there for hours sometimes. I guess the sound of the flowing water was soothing to her. Dora is a rescued feral cat. She would lie down beside the fountain for hours at a time. I think she enjoys the sound of flowing water. The biggest surprise was in the litter boxes though. Amanda cleans the litter pans and she discovered an immediate and large increase in the size and number of the urine-clumps in the litter trays. After learning of this, I knew the cats were drinking more water. This was good. The pump in the unit does make a light humming sound and of course the falling water sounds like running water. I like the fact that you can adjust the rate of water flow by turning the flow control knob that is inside the bowl. You can turn it down so that the water doesn’t make any noise. Another thing I like is that the water reservoir is easy to refill and replace. I take it to the kitchen sink and fill it back up. Then I flip the reservoir back over while it is still over the sink, before I carry it over to the fountain. I do this because it will drip just a little bit of water right as you flip it back over. Once it is over, a one-way valve prevents any water from coming out until you reinstall it back in the fountain. The instructions tell you to quickly flip it over right at the back of the fountain, but I just find it easier to do over the sink. Pogo, our large tabby, is fascinated by jugs of water. He wants to “get inside” them to see what is in there. A few years ago we tried one of those gravity-fed water jugs like you see at the discount stores. He would turn those things over and spill the water everywhere. Fortunately, the base is too wide on the Drinkwell Platinum for him to turn it over. I would say the fountain is very stable. So those are the main positives that I can tell you about. Now I will tell you the negatives……. Pogo is our large orange tabby. He is always fascinated when the reservoir gurgles. Yes, you will have to clean the fountain on a regular basis. How often will depend on how many cats you have and what type of water you put in the fountain. Some people like to use bottled water in the fountain. The problem is that bottled water has no chlorine in it. This means that mold and slime will get a foothold in the fountain much faster with the bottled water than it will with the chlorinated city water. The instruction manual that I looked at does not state an exact frequency for cleaning the fountain. But from my research, I believe if you use bottled water, you may need to clean it every week. If you are using chemically-treated municipal water, you might be able to go as long as 3 to 4 weeks between cleanings. It depends on how strong the chlorine is. The manual states that the filter is optional. I recommend using a filter if you have more than 1 cat. If you do use a filter, then it must be changed out every 4 to 6 weeks according to the manual. It also states that you can rinse out the filter and reuse it. This means that if you clean the fountain itself every week, you can just rinse off the filter and continue to use the same filter until it is 4 to 6 weeks old. Then throw it out and put a new one in. We found that our municipal water is very good at preventing mold and slime. I can clean the fountain once every 3 or 4 weeks and it is not too bad. Our filter, however, is shot after 3 or 4 weeks. It is the first thing that gets moldy and slimy and I don’t like to reuse a moldy filter. If you do, it will just recontaminate the fountain with mold. We have 3 cats. Pogo weighs about 17 lbs, Pepper weighs about 12 lbs, and Dora weighs about 8 lbs. They drink the water so fast, that the water doesn’t have time to sit and make the fountain get slimy. I have to refill the reservoir every 3 days or so. The fresh, chlorinated water that I am constantly putting in seems to disinfect the unit somewhat and slow down the slime formation. However, with multiple cats, the filter will need changing more often. Pepper taking a drink from the Drinkwell Platinum. Ironically, if you only have a single cat, the water will stay in the fountain longer and your fountain may get slimy faster and need cleaning more often. You must have a long, skinny brush to clean this intake tube. 1. You will need a long, skinny brush to clean the fountain. You must have this type of brush to clean the intake tube. I bought the Drinkwell Pet Fountain Cleaning Kit. It has the long brush you need for the intake tube. 2. Get a foam puff wand. I highly recommend a foam puff wand. You can use the large brush in the cleaning kit but I much prefer the puff wand. You will see why if you have the chance to try both. 3. Remember to clean the pump assembly and the internal motor. The manual doesn’t state exactly how often you must clean the motor but the Drinkwell Faq page states that it must be done every 2 weeks. In my opinion you may be able to go a little longer than this based on how many pets you have and the chemical properties of your water. As you gain experience cleaning your fountain, you will get a better idea of how long you can go between cleanings. But do clean it! If you don’t it will ruin the motor and you will have to buy a replacement motor. The pump assembly and it’s internal motor must be cleaned by hand. It cannot be put in the dishwasher. Even though the pump is designed to work under water, there is a cord attached with an inline connection. You should not get this inline plug/jack connector wet! If you get water up inside the connector, you must make sure it is dry before you plug the fountain back in. Otherwise it may short out. Be sure to read the safety precautions in the manual for additional guidance. This is the inline power connection between the AC adapter and the fountain. Don’t get this wet! 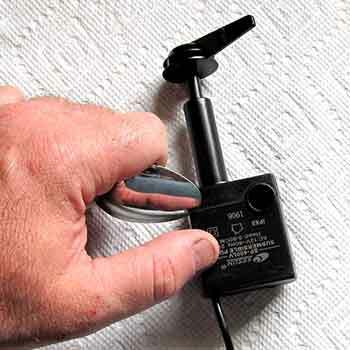 Remove the pump assembly from the bowl. The pump has some serious suction cups on it so it will take a little force to get it out. I suggest placing the pump on a towel. The suction cups are strong and they stick to everything. You will soon tire of trying to remove the pump from the coutertop or sink. The suction cups are strong. Place the pump on a towel so it doesn’t stick to your countertop. 2. Remove the intake plate. The manual says you can use a fingernail to pry it off. Mine was on tight enough that I thought my fingernail would break before it came off. I ended up using the edge of a spoon to pry it off. Don’t use a sharp object since you could cut yourself if you slip. 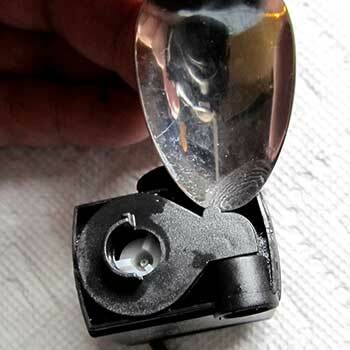 I cannot get the intake plate off with my fingernails so I use the edge of a spoon to pry it off. There is a little pull-tab that must be used to remove the stator. Once again, the manual says to use a fingernail. I chose to use my spoon again and that worked pretty well. A spoon works nicely to lift up on the stator tab. My spoon worked nicely to lift out the impeller. 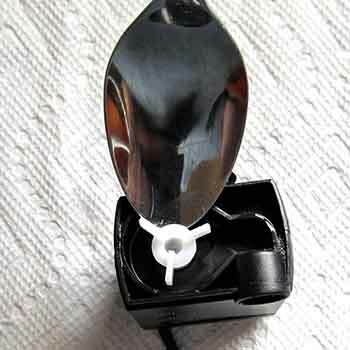 I use a spoon to lift out the impeller. 5. Clean the motor cavity. Now that the impeller is out, you need to clean inside the motor cavity to remove the mold and buildup that is in there. I first tried the small motor brush that came in the cleaning kit, but it seemed a little big for the job. I then tried a cotton swab and that was perfect for cleaning the motor cavity. A cotton swab fits inside the motor cavity perfectly. 6. Clean the other parts. 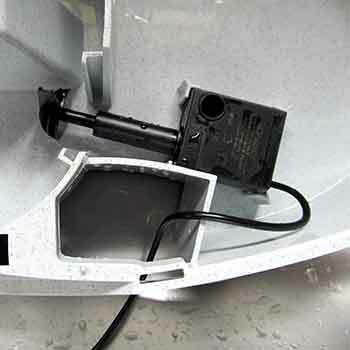 You can use the small brush to clean off the impeller and also to get up inside the intake-plate tube as shown. 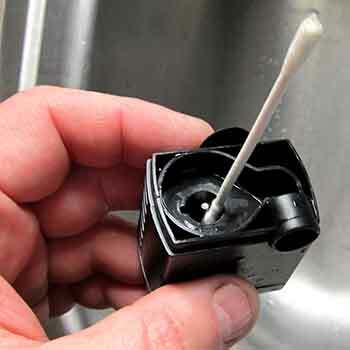 Use the small brush to clean inside the intake plate tube. When you put the intake plate back on the motor, be sure that the knob is facing up as shown. When you snap these 2 parts back together, make sure the knob is facing up as shown. 8. Place the pump assembly back in the bowl. Place the cord through the opening like this. Run the cord through the opening next to the pump. 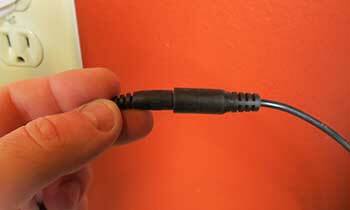 Then secure the cord in the cord channel. There is a notch at the back of the fountain for the cord to pass through. This is so that when you sit it on the floor, it is not sitting on the cord. Place the cord inside the cord channel. 10. Reassemble per the manual. Put the fountain back together and place it in the spot where it will stay. It is very important that you fill the bowl and the filter housing up with water before you plug in the pump. This is so the pump is primed. If you run the pump dry, there is a good chance you will ruin the motor in the pump. Fill the bowl and filter housing up with water before you plug the pet fountain back in. This is an important step! The Drinkwell brand was acquired by Petsafe in 2009. 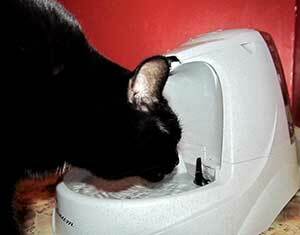 Petsafe is now the official supplier for Drinkwell fountain parts. Here is the link for the Drinkwell Platinum Fountain Pump. This cat fountain does a great job at what it is designed to do. It persuades cats to drink more water. For the money, I don’t think you could ask for more in a fountain. Yeah, cleaning is the downside, but all fountains of this type with submersible pumps are going to need regular cleaning. It’s not perfect, but at this time, I believe it is the best pet fountain in this price range. How long can you leave the fountain running without burning out the pump motor? It is designed to run 24/7? Thanks! You can and should let it run 24/7. However, letting the motor get dirty will cause premature failure. If you clean it regularly it should last for a few years. The manufacturer claims about 3-4 years life expectancy. A replacement motor is only around 17 dollars. Great information !! Thank you for taking time to do this. Can I get a stronger motor? I don’t think you can Susan. 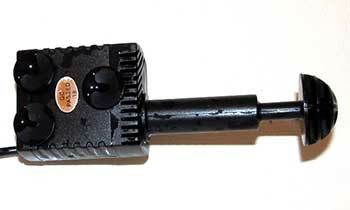 The stock fountain motor works fine for me but it must be kept clean to function properly. Petsafe aquired Drinkwell and is now the official supplier of replacement parts. Here is the replacement pump. So far, my cats do not like this fountain and I am at my wit’s end. It is a nice fountain and they SHOULD like it, but mine do not. I have been waiting for 3 days for them to get the hang of it and none of them can. I don’t get it. What were they drinking out of before you got the fountain? 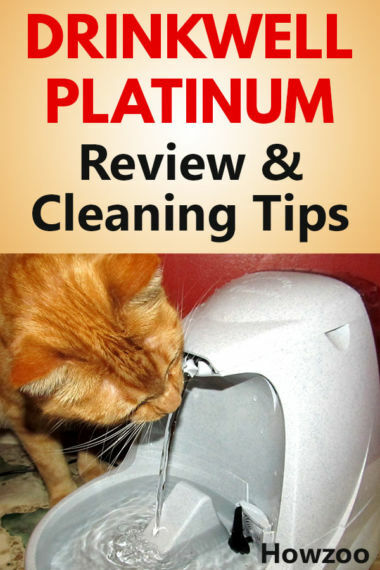 Great advice about fighting the bioslime issue with pet fountains (and all pet water bowls). I found an additive called Better Breath, created by my cat’s vet, that miraculously solves this problem. It’s basically silver citrate, and is tasteless. Kills the bacteria, molds, fungus etc that forms the bioslime. I just bought this one today but we have an early one which we have been using for over 15 years with the original motor still working. I did have to break one of the wings on the motor of when on broke to balance it but our cats and our fosters love it. Our blind girl loves it too. We’ll set the new one up tomorrow. The gurgling sound is made when the bottle is filling up the bowl. This is normal. I was wondering approximately how much hydro the unit uses as it runs 24/7. So far Molly isn’t interested in the fountain but I’m waiting a few more days to see if she’ll use it. If not I can give to my daughter for her no to fussy cat but I don’t want to run her hydro bill up either. If you have basic info in that it would be appreciated. Thank you. It doesn’t use much water since the water is recirculated. That is why it uses a filter. You should use no more water than you would use with just a water bowl. How do you change the motor when its got the thing keeping it in the fountain? The motor has suction cups that hold it down. You just pull it out with a little force. I have a mini , fountain works find but seems to leak by the seam where it snaps together in the back . any help ? 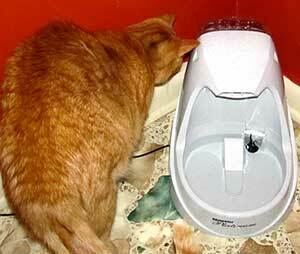 Sorry Russ, I have not used the Drinkwell Mini Pet Fountain. You can’t set the water level but you can control the pump speed with the black knob connected to the pump. Check the little screen that fits right behind the pump knob. 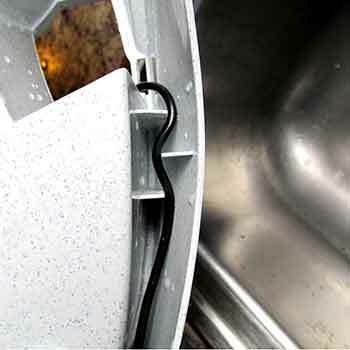 That will get clogged up with hair and prevent the water from circulating like it should causing the bowl to overflow.